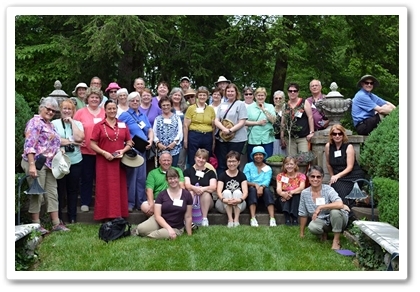 In June of 2016, garden communicators from GWA Region III had a two-day get-together in the Louisville, Kentucky, area. One of the highlights of the garden tours was a visit to the home and gardens of author Sue Grafton, whose home is just east of Louisville. 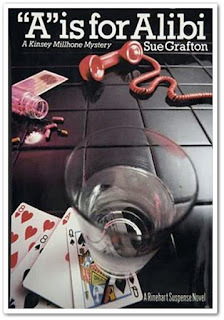 If you aren't aware of who Ms. Grafton is, perhaps you've heard of her books. She's the prolific author of the "Alphabet Series" of detective novels. Beginning with A is for Alibi in 1982 and ending with Y is for Yesterday in 2017, she wrote the series after a 15-year career writing screenplays. When we sat in Grafton's sunroom that Friday afternoon, listening to her share writing methods and anecdotes about her writing career, we didn't know that she already was battling cancer. On December 28, 2017, we were saddened to hear that Sue Grafton lost that battle and passed away at her second home in Santa Barbara, California. Those of us who had the privilege of spending that day with her began reminiscing about it. I realized I'd never written a blog post about the visit, so I'm righting that wrong here and now. 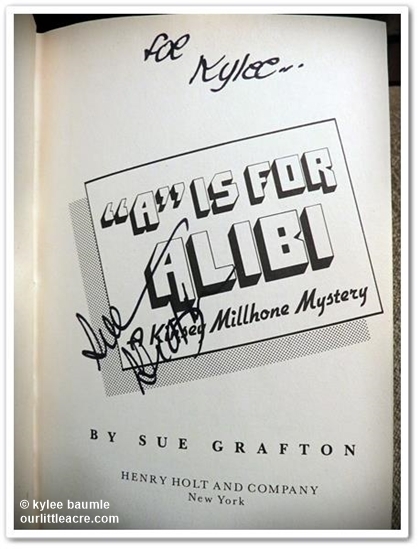 When I heard a couple of months prior that we were going to be visiting Sue Grafton's home, I immediately bought a copy of the first book in her famous series. Though many who attended that day were already fans of her writing, I had yet to read a single book she'd penned. Detective novels aren't my favorite genre (that would be historical fiction), but I wanted to read at least one before I met her. A is for Alibi was a good read. By the time I got to the ending, which was worded brilliantly, I could understand how and why people were so enamored with her writing. Of course, I took my copy of her book with me for her to sign, which she so graciously did. I gave her a copy of my own first book, Indoor Plant Decor: The Design Stylebook For Houseplants, as a hostess gift. Sue and her husband, Steven Humphrey, purchased their beautiful home in 2000. The property encompasses nearly 30 acres and was the former estate of hardware mogul William Belknap. The home was built in 1911, and Belknap named it Lincliff. Situated along the Ohio River, it is listed in the National Register of Historic Places. We started our visit with Sue welcoming us into her home, where we then settled in for a fun and informative chat with her. She explained how she approaches her writing and encouraged us to be less inhibited in our own writing. Her husband, Steve, gave a tour of the gardens, but we were also allowed to roam her property at our leisure. The gardens were formal in design, which complimented the Georgian Revival style home. It was Steve who took on the restoration of the gardens and he did his research, discovering that John Olmsted, nephew of Frederick Law Olmsted, designed the original residential layout. About 20 years after the home was built, it was landscape architect Bryant Fleming, designer of Nashville's Cheekwood Estate, that created the gardens. Steve had access to the original plans and used them to guide his restoration. Steve became interested in gardening before Sue, and he taught her to appreciate the finer points of landscaping. Besides the tailored gardens on the property, they grow edibles too, such as potatoes, asparagus, and an assortment of berries. I don't recall seeing that part of their gardens, but our time was limited enough that we couldn't take in the entire property. At the time of our visit, Sue fielded a question about what she would do once the final letter "Z" was finished in her series of Kinsey Milhone adventures. Since she had just finished writing Y is for Yesterday, which was released three months after our visit, she still had plenty to think about for Z is for Zero, slated for release sometime in 2019. But she said she had no writing plans past "Z." GWA Region III meeting attendees. I was shocked when I read that she had died. I loved her books. I have read every one of them. I even got my husband to read a few of them. I think you were quite lucky to meet Mz Grafton and to see her home and garden. What a pleasure that must have been. Who knew she was a gardener or at least a garden appreciator. Thank you for sharing this tour of Sue Grafton's home, it reminds me of an English estate. As you quoted, I also read that the book series ends with Y.